red color walls and a small design of a mountain range repeating all the way down, it made this already cozy atmosphere much more comfortable. corn salad or fried green tomatoes to start; to a roasted pumpkin steak with a tomatillo sauce and cumin creme fresche. the softness and absorb the smokiness of the grilled fennel. Contrasting flavors of sweet and sour in the lemon vinaigrette, made the balance of this dish a very enjoyable first course. forward. Just a slight touch of chives and a little olive oil made this dish simple yet enjoyable. filets of fluke fish and the vegetables on either side. Creativity of presentation and understanding the consumer allow this dish to either be nice and light or warm and filling. Very well done allowing the diversity of the dish to create a lasting impression. complimented by just a few dominant grapes from around the world. I am a lover of the Italian reds, and was excited to see the three most desirable Italian reds offered by the bottle, Barolo, Barbaresco and Brunello di Montalcino. Spanish and French wines are also available. There are a variety of wines offered by the glass and by the half glass making it fun to mix and match. One nice touch not seen at most places was the wines by the glass were poured at the table allowing one to see the bottle, find out a little more information on the wine and creating a nice personable feel. Nice touch! 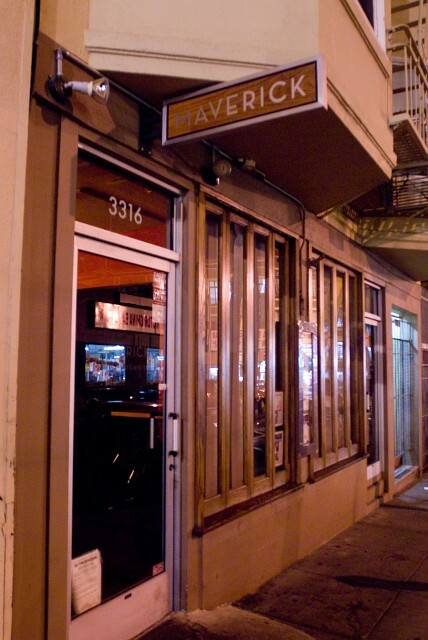 makes Maverick American Eatery and Wine Bar a step above most, creating a destination for everybody in the city of San Francisco. Don Saliano is a current member of the food industry and an aspiring restaurant critic. Be the first to comment on Maverick (San Francisco, California)!